Boise State captains Kellen Moore, Winston Venable, Jarrell Root and Nate Potter walk onto the field for their NCAA football game against Virginia Tech, Monday, Sept. 6, 2010, at FedEx Field in Landover, MD. Boise State won 33-30. 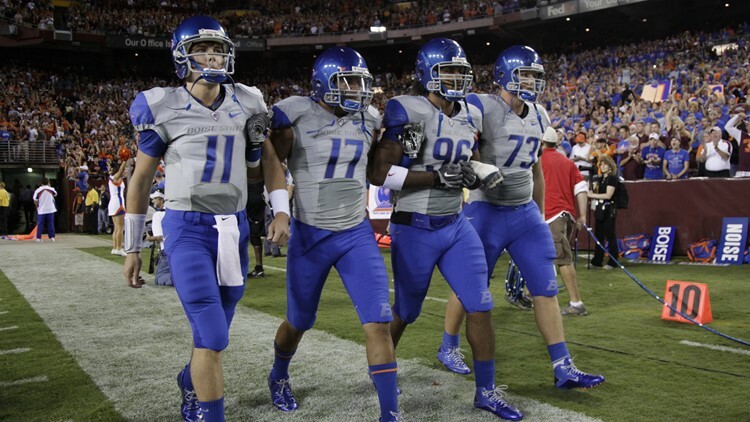 When did this stretch of Boise State football excellence begin? It wasn’t when the century turned. Lest we forget, it was right before that, in 1999. BOISE, Idaho — Wednesday, April 17, 2019. There are lots of Twitter accounts out there that like to post top 10 lists. One is @SportsPac12, which naturally draws from college football and basketball. Yesterday it was “Best College Football Winning Percentage over the Past 20 Years (1999-2018).” Boise State’s commonly at the top of lists like this, but they’re usually “this decade” or “since 2000.” What I like about this one is that it truly nails the start of the Broncos’ amazing run. The 1999 season is typically left out, because it was a year before the new century. But when you use this actual 20-year time period, it’s Boise State in a rout at 83.1 percent, followed by Ohio State at 80.6 percent and Oklahoma at 80.4 percent. Since 1999, the Broncos are 227-44. It’s as official as can be now after being, well, reiterated Tuesday on Marshall’s website. BroncoSports.com still says Boise State’s game against the Thundering Herd will be played on Saturday, September 7. But it will, in fact be contested on Friday. FBSchedules.com first reported the change in late February after a public records request. I said at the time the site “must have really, really, really wanted to know.” Marshall then confirmed the switch. Still no kickoff time mentioned (bet on 8:15 p.m.) nor TV network (hope for ESPN or ESPN2). Idaho coach Paul Petrino sure likes to get the work in, and so it will be Friday night when the Vandals play their annual Silver & Gold Spring Game in the Kibbie Dome. The Vandals will break into two teams and line up against each other for four 15-minute quarters with traditional football scoring. In other Vandals news, former Idaho standout Benson Mayowa has signed with the Oakland Raiders. The unrestricted free agent defensive end played for the Arizona Cardinals last year and turned in his best NFL season, with 38 tackles (13 for loss), four sacks and a fumble recovery. Mayowa played previously for the Raiders in 2014-15. Sandwiched around that were stints with the Seahawks and Cowboys. To say the Idaho Steelheads got mixed results in the first two games of their Kelly Cup Playoff series last weekend would be an understatement. After the Steelheads were pelted 7-1 by Utah in Game 1, they rallied for a 3-2 overtime victory in Game 2. The one constant was the Steelies’ penalty kill unit, which went 7-for-9 in the two games against the Grizzlies. That included the wipeout of two five-minute power plays and one 5-on-3 power play. Idaho was ranked ninth in the ECHL on the penalty kill during the regular season. If the Steelheads can square away other facets of their game to match, they can regain control of this series. Game 3 is tonight in West Valley City. Nevada has landed a hoops matchup that’ll generate plenty of buzz among its fan base. Through a public records request (speaking of public record requests), Nevada Sports Net has learned that the Wolf Pack is set to face Saint Mary’s on December 21 at the $1.3 billion Chase Center, the new home of the Golden State Warriors on the San Francisco waterfront. The game is part of the Naismith Memorial Basketball Hall of Fame Series, which the Pack played in the past two seasons at Staples Center in Los Angeles. Boise State doesn’t have any games officially listed yet for 2019-20, but we know the Broncos will play at Oregon again to wrap up their 2-for-1 arrangement with the Ducks. Adonis Arms certainly built up his resume this past season at Northwest Nazarene, garnering Great Northwest Athletic Conference Player of the Year honors after leading the conference with 20.6 points and 1.9 steals per game. Four weeks ago Arms elected to transfer, saying he wanted to pursue his dream of playing Division I basketball. And he tweeted Tuesday that he has landed at Winthrop University in South Carolina. The Eagles, a member of the Big South, finished 18-12 last month, but they have 10 NCAA Tournament appearances in the past 20 years. Organizers for the Race To Robie Creek say there’ll be no problem with course conditions for the 42nd running of the iconic event on Saturday. The upper reaches of Shaw Mountain Road about a mile from Aldape Summit took a beating during heavy rain a week ago. There’s a slight chance of showers predicted Saturday with a high of 62. If the showers are slight, that’ll actually be perfect running weather. The Robie field this year numbers 2,515 entrants, representing 30 different states and British Columbia. And most are asking, “What to wear?” The 2019 theme is superheroes, as in, “The Birth of Wonder Toad.” Will they be running Robie in capes? In only his fourth major league start, former Idaho Vandal Bill Stoneman throws a no-hitter as the Montreal Expos beat the Philadelphia Phils, 7-0. Stoneman would go 54-85 in eight big league seasons, but he threw two no-hitters. As general manager of the then-Anaheim Angels in 2000, he would play a role in the separation of the Angels from the Boise Hawks organization in what the new Hawks owners termed a dispute over guaranteeing long-time manager Tom Kotchman’s return to the club.